An underride crash is a type of motor vehicle crash in which a car slides under the body of a large truck due to the height difference between the vehicles. 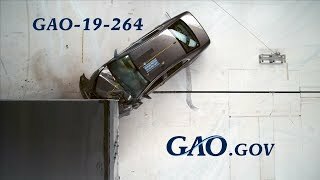 GAO reviewed the data the Department of Transportation reports on underride crashes and the development and use of underride guard technologies in the U.S.
A truck underride crash occurs when a car slides under a large truck, like a tractor-trailer. The car's passenger compartment can be crushed, potentially killing or severely injuring occupants. Researchers told us that underride crashes likely happen more often than the Department of Transportation's data suggests. DOT requires trailers to have a rear safety bar—known as an underride guard—to prevent underride crashes, but it doesn’t require them to be inspected. DOT also hasn’t researched challenges to using underride guards on the sides of trucks. We made 4 recommendations, including that DOT improve data and research the use of side guards. In a simulated truck underride crash, a sedan slides under the back of a tractor-trailer. The passenger compartment of a silver test sedan is crushed beneath the back of a tractor-trailer in a simulated crash. According to crash data collected by police and reported by the Department of Transportation's (DOT) National Highway Traffic Safety Administration (NHTSA), fatalities from “underride” crashes, such as those pictured below, represent a small percentage of all traffic fatalities. From 2008 through 2017, an average of about 219 fatalities from underride crashes involving large trucks were reported annually, representing less than 1 percent of total traffic fatalities over that time frame. However, these fatalities are likely underreported due to variability in state and local data collection. For example, police officers responding to a crash do not use a standard definition of an underride crash and states' crash report forms vary, with some not including a field for collecting underride data. Further, police officers receive limited information on how to identify and record underride crashes. As a result, NHTSA may not have accurate data to support efforts to reduce traffic fatalities. Underride guards are in varying stages of development, and gaps exist in inspection of rear guards in current use and in research efforts for side guards. NHTSA has proposed strengthening rear guard requirements for trailers (the rear unit of a tractor-trailer) and estimates about 95 percent of all newly manufactured trailers already meet the stronger requirements. Although tractor-trailers are inspected, Federal Motor Carrier Safety Administration annual inspection regulations do not require the rear guard to be inspected, so damaged guards that could fail in a crash may be on the roadways. Side underride guards are being developed, but stakeholders GAO interviewed identified challenges to their use, such as the stress on trailer frames due to the additional weight. NHTSA has not determined the effectiveness and cost of these guards, but manufacturers told GAO they are unlikely to move forward with development without such research. Based on a 2009 crash investigation, the National Transportation Safety Board (NTSB) recommended that NHTSA require front guards on tractors. NHTSA officials stated that the agency plans to complete research to respond to this recommendation in 2019. However, stakeholders generally stated that the bumper and lower frame of tractors typically used in the U.S. may mitigate the need for front guards for underride purposes. Regarding single-unit trucks, such as dump trucks, NTSB has recommended that NHTSA develop standards for underride guards for these trucks, but the agency has concluded these standards would not be cost-effective. Truck underride crashes are collisions in which a car slides under the body of a truck—such as a tractor-trailer or single-unit truck—due to the height difference between the vehicles. During these crashes, the trailer or truck may intrude into the passenger compartment, leading to severe injuries or fatalities. Current federal regulations require trailers to have rear guards that can withstand the force of a crash, whereas the rear guards required for single-unit trucks do not have to be designed to withstand a crash. There are no federal side or front underride guard requirements. GAO was asked to review data on truck underride crashes and information on underride guards. This report examines (1) the data DOT reports on underride crashes and (2) the development and use of underride guard technologies in the U.S. GAO analyzed DOT's underride crash data for 2008 through 2017; reviewed NHTSA's proposed regulations and research on new guard technologies; and interviewed stakeholders, including DOT officials, industry and safety groups, and state officials selected based on reported underride crash fatalities and other factors. GAO recommends that DOT take steps to provide a standardized definition of underride crashes and data fields, share information with police departments on identifying underride crashes, establish annual inspection requirements for rear guards, and conduct additional research on side underride guards. DOT concurred with GAO's recommendations.